2011 marks the 10th Anniversary of the Hwy 62 Art Tours in Morongo Valley. On the weekends of October 21-23 and 28-30 you can visit the homes and studios of 100 of the desert’s most adventurous artists in all mediums. The free, self-guided tour ranges from the wetlands of Morongo to the wildlands of Wonder Valley. 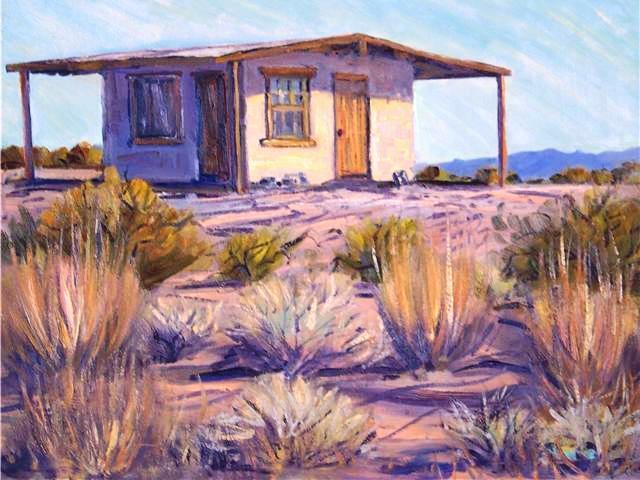 Artists have been reinhabiting the old jackrabbit homesteads in the high desert for years now, creating a culture and society that bears little resemblance to the scene in Palm Springs or LA. Many communities—Asheville, NC, Bainbridge Island—sponsor artists’ studio tours, but only in Joshua Tree are the artists’ homesteads themselves such a major attraction. Because of the remote locale and heavy concentration of talent, this is the premiere art studio tour in the country. Yet—even after ten years–relatively few people know about it. Before you venture out, pick up a catalog and map. Plot your course, noting the studios you want to visit. It’s impossible to see them all. Take along a friend as navigator. Don’t forget snacks and water (at times you’ll be a long way from a café), and pick up the Special 10thAnniversary CD: Hwy 62 Love Songs (Victoria Williams, Vic Chestnutt. Tim Easton and more). Pop it in the CD player then head out on those tantalizing dirt roads. You might not end up where you planned, but by day’s end you will be stoked. Fans of desert landscape painting will want to drop in on Robert Arnett—one of the earlier artists to settle in 29 Palms; David Greene, master of the Mojave moonlight (for more on Greene, see http://www.californiadesertart.com/?p=1040); Deborah Martin, a contemporary realist who paints the Salton Sea and Wonder Valley; Tina Bluefield and her abstract landscapes; and Diane Best a fine landscape painter inspired by the 19th century conservationist-landscape artists.